The Larson Davis PRM2103 has been designed to be used with an environmental shroud for portable or permanent outdoor use in a wide range of weather conditions. The PRM2103 combines the cost savings of a standard preamplifier with features for unattended monitoring and an inexpensive shroud to create a product that is ideal for remote sound level measurement. New in the PRM2103 is an automatic calibration check that checks five different frequencies all at the same time which enables better detection of any failure. When used with the Model 831 sound level meter, the acoustic response can be selected as free-field, random or 90 degree using a simple setting on the sound level meter. Because of this flexibility, only one preamplifier is necessary and there is no need to use different microphones for different fields. 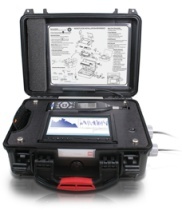 Because field visits to a remote monitor can be expensive and time consuming, the PRM2103 has been designed to require no routine maintenance. It includes a built-in humidity and temperature sensor and can automatically turn on an internal heater when there is a risk of condensation. All this has been accomplished while keeping power usage low (< 2 mA with heater off) so that the PRM2103 is an excellent solution for battery powered applications. The EPS2116 is designed to work with almost any combination of ½ inch precision microphone and preamplifier for outdoor use. Because the EPS2116 is designed with an integral rain shield it will keep your microphone dry even in a driving rain. Combine the EPS2116 with the Larson Davis PRM2103-FF outdoor microphone and Model 831 sound level meter to produce an ideal outdoor noise measuring system, without the need for desiccants and with minimal routine maintenance. When combined with the PRM2103-FF the integrated heater eliminates the need for desiccants and the remote calibration check minimizes routine maintenance. By using the EPS2116 with the Model 831 or SoundExpert LxT sound level meter, the built in correction filters allow for class 1 response in free field (0º), random (diffuse), or 90º fields. This is accomplished with a single microphone, Model 377B02, and a simple selection on the sound level meter. The Larson Davis 426A12 Outdoor Microphone has been designed for permanent outdoor use in any weather condition. It is constructed of stainless steel to resist corrosion, and its profile minimizes both wind resistance and acoustic reflections. It includes a rain hat, wind screen and bird spikes and an electrostatic actuator which can be controlled remotely for on-site calibration checks. With the proper choice of microphone, it can provide frequency response characteristics consistent with precision sound level meter requirements for free-field measurements. Equipped with A, C and Z-weighting filters and a 20 dB gain, the 426A12 is ideal for use with any electronic sound measurement system. A hydrophobic membrane vent and replaceable desiccant cartridges prevent moisture from reaching the microphone through the vent. The saturation status of the desiccant cartridges can be determined remotely using signals from internal temperature and humidity sensors, as well as visually through an observation window. The Larson Davis Model 831 sound level meter is the ideal complement to the Model 426A12 Permanent Outdoor Microphone for Noise Monitoring Systems. EPS2116 Environmental Shrouds Data Sheet. 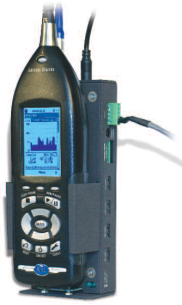 Model 831-INT-ET hosts the Model 831 sound level meter as the heart of a noise monitoring system; and provides the interface to different peripheral devices such as Meterological Transducers, 3G modem, router, solar panel and battery.